Union defender Jack Elliott celebrates after scoring one of his two goals against the New England Revolution. When Jack Elliott took the field in Portland's hothouse atmosphere on Aug. 5, he hadn't played a second for the Union in two months. It sure didn't look that way, though. Even more impressively, Elliott didn't lose a step playing three full games in eight days: that contest at Portland, the U.S. Open Cup semifinal last Wednesday at home, and Saturday's dramatic 3-2 win at New England. 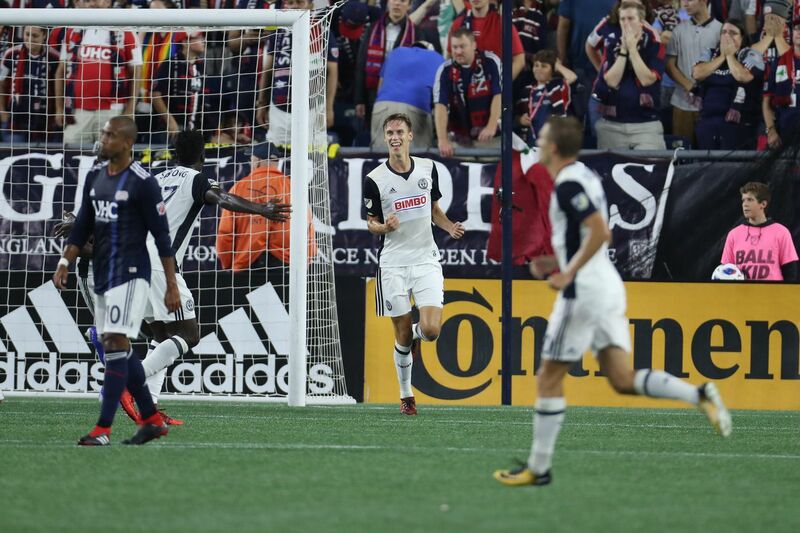 His two goals against the Revolution got the headlines, of course — especially the brilliant backheel finish of a corner kick sequence that opened the scoring. It was a tremendous piece of skill and instinct. "I realized I had run past the front post, so I couldn't do much else," he said. "It was almost perfect that I kind of just flicked it on back to get any sort of touch on it and redirect it, and make it hard for the goalkeeper." But the goals are just part of the story for a player who seemed written off when Mark McKenzie overtook him on the depth chart. "I just figured I'd get another chance to get in and play, and I knew when I got that chance I wouldn't disappoint, and I'd be ready for it no matter what," Elliott said. "It was a bit daunting to go to Portland, and then the midweek game, and then Saturday. Having not played 90 minutes for a while, in your mind you think maybe it might be very tough, but surprisingly, it felt really good." All of that might not have happened in the first place had McKenzie not suffered a left knee injury in a practice session in Portland ahead of the game there. "It's never easy when you're called upon and have been out for a little while, but Jack stepped up like a true professional, so I'm really happy for him," Union manager Jim Curtin said. McKenzie is back practicing, and Curtin said he could be in game shape by the end of the week. Curtin wants to be absolutely certain, though, because one of MLS' top strikers is coming to town in New York City FC's David Villa. "Jack is coming off of a pretty good game and a pretty important win, so we can be maybe a little more cautious with Mark," Curtin said. "There's no controversy there. Both guys are playing really well. We'll have a decision to make on the weekend if Mark is 100 percent ready to go. To play against David Villa, you'd better be 100 percent."